Catch up with the community ahead of the fighting legend's PC debut. The UK’s first Tekken 7 King Of The Iron Fist qualifier took place at Bandai Namco’s UK HQ last week. A large amount of the UK’s Tekken community travelled to take part, alongside a few international guests, all vying for the opportunity to win a place in the King Of Iron Fist tournament final taking place next year in Japan. The grand prize is three million yen—about $27,000! The UK scene is in a weird place at the minute. Tekken 7 has been out in arcades for around 18 months, but never freely available to be played on these shores. All major fighting game gatherings are running Tekken 7 events, but a good chunk of the fanbase simply can’t practice on the latest game and are instead left to carry on playing Tekken 6 or Tag Tournament 2. 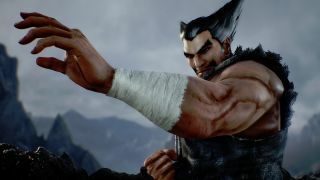 There’s a feeling that the scene is ‘treading water’ right now, and it was clear that Tekken 7's prolonged absence has had an impact. "Honestly, it had a massively negative effect on the scene" says Justin Xavier, tournament organiser of VSFighting, one of the UK’s bigger annual fighting game events. "Tekken Tag 2 came out and it was a pretty good game but it was very much based on the Tekken 6 engine and we'd been playing that for 5 years by then, and that had been around in Korea and Japan even before that. So we were looking at a really old game from the day it was released. A lot of people were getting tired of it, and people started to play other games—especially as the fighting game community started growing." "When we saw Tekken 7, the initial feeling was that this was going to happen again" Xavier continues. "The first release did look, graphically, a bit older. Then, Fated Retribution came along! Total graphical overhaul. It sounds silly, because we could all play this game with basic graphics, but this feels refreshing. A lot of the old characters have been tweaked. You really feel like you're getting a new game this time and you're seeing the effects of it today. People just want to play it!" Noted Korean Jin player CherryBerryMango was entered into this UK qualifier, as he is currently studying at university here. A quick look at the Twitch chat on the day seemed to indicate that he was the favourite to win—not only because of his high level of skill—but also because, unlike almost every other player in the tournament, he has had a bit more access to the arcade version of the game. He’s played it considerably more. A quick look at his YouTube channel shows plenty of appearances in Korean arcade tournaments. In one of the very first matches of the day, that script was thrown well and truly out of the window. Bamagix, playing as Forrest Law, took CBM right to the final game and managed to win, dumping CBM into loser’s bracket for the rest of the day. It was a genuine shock result and one that caused the room to go crazy, even at this early stage! It showed that this was not going to be an easy win for anyone on the day. The level of Tekken shown throughout the day was of a ridiculously high standard, made all the more impressive by the fact that most of these players have had very little hands-on time with the new game. The core of Tekken is very much intact, but there are certain little things that change game to game in this genre that take some getting used to, especially when you're playing competitively. "There's two factors to this" says Justin. "Firstly, we've been playing Tekken for ages, so we understand the system and the system change—overall—is quite similar Tekken to Tekken, compared to other fighting games. Some of the old fundamentals carry over. The second is that, even though we can't play the game, there's high level footage from Korea and Japan. So by looking at videos and understanding what is going on, we're able to piece together how we're going to play this character so we can pick it up within a few minutes." This sentiment is echoed by Manchester Battle Arena TO Esmond Fong. "That's the problem, we're not as prepared as some of the Korean players right now" Esmond says. "Like, CherryBerryMango, he's had regular access to the game back in Korea. The only way for us to have access to [Tekken 7] is at big events, like MCM Comic Con, or PLAY Expo. All we can do otherwise is watch videos and streams, try and memorise or take notes. That's all we can do!" After a long day of Tekken, the grand final saw the return of CherryBerryMango, who went on a tear through the loser’s bracket, not losing a single game during the top 8 after his first round loss. It was the longest possible route to the final and showed that CBM really is the force many considered him to be. His opponent was Kaneandtrench, a UK player who had dominated the winner’s side of the bracket. He had lost one game all day. He even started out in the same group as CBM. After losing his second game of the day, Kaneandtrench rallied to win three straight sets against the favourite to win the tournament. His Yoshimitsu play provided some incredible moments, including this teleport to dodge Jin Kazama’s Rage Art at the very last second. The crowd were very much in the Kaneandtrench camp, chanting his name between games, and predictably lost their minds when the UK player defended their turf and spot in the King Of Iron Fist Tournament. It was a grand old day for UK Tekken. A champion crowned and set to represent the community in 2017. A chance to play on the forthcoming game and to see that—perhaps crucially—their faith in the Tekken franchise has not been misplaced. Tekken 7 is already a very good fighting game. With the game having roots in the UK that tie it directly to the PlayStation boom of the 90s, it looks set to do very well here. The UK Tekken community is ready to grow with it. "Tekken 3 is one of the biggest selling fighting games of all time, so there's a massive amount of nostalgia for the series" says Esmond. "I think that they're going to relate to that when they get Tekken 7, but now there's also so much depth and ways to play. With Akuma being added to the game, there's a lot of the Street Fighter scene thinking about checking out Tekken 7 too! A lot of people are looking at this as the next step in 3D fighting games. There was a lot of interest at PLAY Expo. Within half an hour, we had a 64 man bracket filled up! There was 200 or so people on that stand. There's just a huge interest in the game." "Provided that it has the right launch, I think it's going to be a phenomenal release" says Justin. "There's no shortage of good players, people want to play fighting games right now. If the release is bad, well, I won't name any names, but we've seen the other side! [Tekken 7] looks excellent for casual and competitive players. I think it's going to be a massive commercial success, which will bring a lot of new players in."